As I've already mentioned, in the last few months I had been on a mission to find as many of the Marc Jacobs Daisy limited edition fragrances as I could. Daisy Sorbet and Daisy Eau So Fresh Sorbet proved to be some of the hardest limited editions to find, which was a surprise considering that they were only released in 2015 so are fairly recent. There are two bottles in this collection but in the image above there are three bottles because I have two versions of Daisy Sorbet; one full and one empty. It is amazing how much even empty versions of these bottles sell for on eBay, let alone full or slightly used bottles. At this point my overall collection is incredibly vast, but I'm relying on finding second hand bottles now. 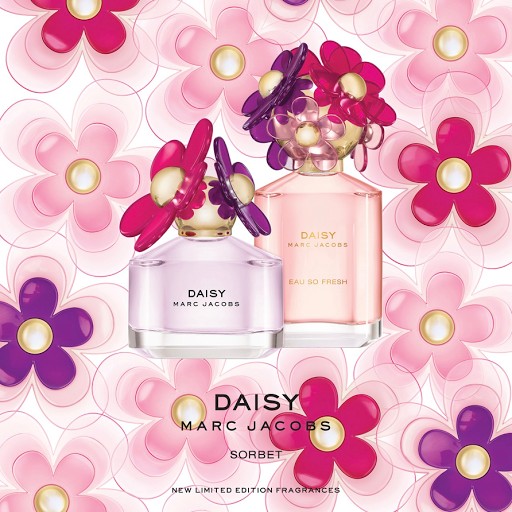 Daisy Sorbet is a 50ml perfume and a variation of the original Daisy; a clear bottle filled with lilac fragrance and topped off with a Daisy triplet as the lid. The daisies are coloured in vibrant shades of dark pink, dark purple and a semi-opaque pale pink in different sizes with gold centres. Visually, I really like Daisy Sorbet especially as part of a the Sorbet or Daisy sets as the colour variations match really nicely. The scent itself of passion fruit, pink grapefruit, please, lily, jasmine, wisteria, musk, cedar and violet. I was surprised by how powerful I found this scent, it lasts well but it feels really strong on my skin so as a result of that I don't love it; the smell is nice but too strong for me. It's quite floral but also fruity, similar to the other scents in the Daisy range. With an RRP of £52, I was lucky to find this for £27 on eBay so comparatively I paid very little for this fragrance. Daisy Eau So Fresh Sorbet is a variation of the original Daisy Eau So Fresh and comes in a 75ml bottle. Visually, the bottle fits nicely next to its sister fragrance, Daisy Sorbet but is taller and with more daisies on the lid. The bottle is clear and hold a pale pink fragrance inside, topped off with a Daisy bouquet lid. The daisies are in shades of dark pink, dark purple and a semi-opaque pale pink with gold centres. The daisies are in different sizes and hide a gold spritzer that releases the fragrance. The scent seems very oriental inspired to me, smelling of mandarin, apple blossom, lotus, magnolia, jasmine, violet, crazy woods and musk. It's very citrus-based mixed in with musky scented florals. I prefer this out of the two sister scents, but it's still not my favourite out of the Daisy range. The RRP is £59, so I was very lucky to find my version for all of £5, although it literally was so empty I had about 5ml of fragrance left which was a shame. Similarly to the Daisy Delight collection, I absolutely adore the advertisements and posters that were circulating around the time of the release of the Daisy Sorbet; I love purples and pinks and so this limited edition was like my personal favourite kind of perfume. I love how the Daisy range visually looks, collectively and individually and I'm a massive lover of floral based scents so if I'm honest all of them suit my taste, although some more than others. The Sorbet collection are not my favourite in the Daisy range fragrance wise, they're a bit too musky, too strong for me but visually they're some of my favourites as the delicate use of shades of pink and purple is totally to my taste.